Fishing as a sport has often been described as an activity that consists of long periods of boredom followed by short and intense periods of excitement. While this statement is not entirely untrue, it misses the point of the exercise entirely and fails to recognize the paramount importance of the events that happen outside those moments of intense activity, which is for many is a big part of why they enjoy fishing. The down time between catching fish allows us those neccesary moments of respite from the world and to reconnect with ourselves. It is a time for solitary reflection and introspection, observation and thought about nature and existence, or a time to talk to a close friend. The truth is if we only fished to catch fish that the whole endeavor could be viewed as an exceedingly productive way to waste ones time. The scientific method can back me up on this. Should one be so inclined to analyze the mathematical calculations of catch rates vs. effort or hours fished they would quickly arrive at the conclusion that ninety percent of their time was spent staring at inert lines and not much else. In the real world where their is an expectation of a return on an investment, people would get fired for such a lack of productivity. But this is where logic and mathematics fall to the wayside and where statistics hold no currency. The algorithms and calculations are deficient in the recognition of the existential moments that occur during these long periods of inactivity, the sonnet within the silence, the crack of light that emerges through the shadows, bringing with it both hope and meaning. They don’t account for the satisfaction of casting a perfect loop of line that unfurls like poetry over a page of unwritten water, still brimming with hope and promise. Or the mysterious way a sunset moves us all to silence and wonder about the magic that is our world. Nor do they recognize the memories that are built and the friendships that are forged during these long periods of inactivity. They cannot explain the prose that is all flowing water, or the breath-taking sight of an eagle soaring high above in the sky. Nor do they explain a myriad of other individual reasons that keep all of us drawn back to waters of a sorts. Sometimes it really doesn’t matter if we don’t catch fish. TO PRE-FISH or NOT TO PRE-FISH? IS THIS REALY A QUESTION! Pre-fishing is extremely important when it comes to fishing tournaments. Better yet, it is important to pre-fish for tournament success! Pre-fishing is as important as going to the gym for a body builder! Practice before the main event and you will have a better picture of the lake! The only way to unlock a lake is to keep fishing it before competition! However, it is important to move on once you have located fish. Remember, your goal is not to land every fish during the pre-fish. Pre-fishing helps paint a picture of fish location and lure selection. Finding fish before competition and knowing what they want to eat is essential for tournament success! Practice, practice, and practice to find the fish you need for winning. My very first event of the year, I failed to pre-fish and it proved deadly. My partner and I had nothing to show for! Furious with this outcome I went back to the lake and hammered out a 15lbs. bag! Every day on the lake is a learning experience. Pay attention to what is working and what is not and you will catch more fish! If you can, get out and pre-fish before the tournament. I guarantee it will help you in your future trip! ‘Till next time: May your hook sets be MASSIVE and your fish be MONSTERS! Never Get Going When The Going Gets Good! I have seen it time and time again; an angler packs up and leaves a spot when the bite is on. But why? Why do we leave when the bite is on, give up on a prime piece of real estate and go home or go elsewhere on the river? The school is alive; three fish then four and five. Then a short break in the action and were gone. I’ve done it before but I will not do it again! Recently out on a trip with my long time fishing partner Todd Penney, we battled wind and dirty water to hook up with a dozen trout. After a long walk up the river for several miles there were no hits, no nibbles and no trout to be seen. We relocated to a rocky bank side walking down river to reach deep slow moving water. Still no action. Copious casts and nada, zippo, zilch. The fish were fussy and getting the best of us. Todd suggested we try one more location which meant we had to walk again, this time two more miles upriver. My legs were tired and I was fatigued but I wanted a fish, one fish, any size or color will do. I was desperate and agreed. While walking up the river we talked about what we thought was happening with the trout. Was it the time of day, was it the dirty water conditions or were the fish just plain not feeding? Left baffled and a little dejected, we reached our destination point, an island in the river with tall pine’s that break the river into two channels. At the time, this location had a large ice shelf which divided the river into a side channel that flowed in right where we stood. In past years, we have had many great days here, but with no fish landed I was not convinced today was our day. A change in lures was in order, I had fished the same lure for an hour and it needed a rest back in my tackle box. I opted for a Blue Fox Minnow Spinner in order to keep the minnow bait from bottom snagging. This lure can work in one inch of water or you can slow down the retrieve and make it work at the bottom. This was the right choice for the structure of the river that day. I launched the minnow spinner far beyond the shallow current that was coming in from that side channel. I did not want to spook a potential taker. As I reeled in I made sure to catch the current of that side channel and let the lure drift with the current. Once my lure was past the shallow shelf and into deeper water, my first taker was hooked in. I was elated and reeled him in so I would not loose the fish. Finally my first fish of the day was out of the way. A quick photo and away he went. What was then about to happen blew both of our minds. Todd was using a Rapala and he was next to hook a trout, a beautiful rainbow. My following cast employing the same retrieve method, another brown trout was hooked. By the time I could get my fish in, Todd had released his. Todd watched as I landed my fish and released him. The school of trout were just getting fired up; one fish after the other was caught. I landed eight fish a Todd about the same. It was late in the day and the sun was setting. I was tired and wanted to leave the river. Todd wanted to change hooks and stay for another half an hour. I agreed and also switched lures; a Berkley Frenzy Firestick Shallow was tied on and fired out. A few twitches and a Bang, another fish. We both caught eight to ten fish a piece in that hole I was about to leave. Five fish after I wanted to leave this prime hole. You just never know what the trout are going to do. Keep fishing even when you think that you have caught all of the fish in your location. Switch hooks and use another color, or a different size of lure. Try a spinner instead of a spoon. A twitchbait instead of a crankbait! Never give up on that spot until you are one hundred percent sure that the bite is off. Never get going when the going gets good! Spring brings season of hope and anticipation of new dreams and goals for fisherman! As the seasons start to open for almost all the fish, the idea of what can be caught runs rapid through angler’s minds! This spring set some goals for yourself. Goals in fishing are important just like goals in all aspects of life. Setting goals can help you become an angler. This spring set out to learn new techniques with the fish that are open and bring what you have learned to the tournament scene. Techniques can be shared between fish, so learning something new with one species will definitely increase the number of your main target species! The beauty about fishing is that there is always something new that can be learned. Fishing is a very dynamic sport! It is constantly changing with the number of variables affecting the outcome of successful day! Don’t always wait for the perfect conditions to fish because if you are waiting then you’re missing out on an educational fishing trip. Even if you don’t catch a fish there is something to be learned. The bottom line is that you have to get out and practice. Set yourself a goal of learning! This spring practice, learn, and fish to be successful when it counts! The alarm clock rings at five in the morning, the sweet sound of music tickles the ears and then you are up and at it. For a trout fisherman who is eager to make the river, five o’clock is no big deal. The knowledge of that first fish gets you motivated like no other type I know of. The river is like a good old friend who welcomes you inside every time you step on its doorstep. That warm feeling of being home overwhelms you. Being away from home too long leaves you unsettled, but once you come home to the river, you know beyond a shadow of a doubt that you belong here! The fish are but just a bonus, like having a grand desert after a good meal. Your heart begins to beat quicker and your fingers tingle with anticipation. The river has a way of bringing you that particular feeling. After a few moments your heart settles and you begin to breathe deeper inhaling that sweet fragrance of pine and cotton wood which overhang the banks of the river. The water is glowing with the first light of the sun touching the dancing pyramids that flow along the far bank. As you glance to your right a deer spooks and bounces through the foliage away from you into the rising sun. Vapor rises from the river as you unzip your back pack and fetch your first lure. Before you tie up you recess and take in the scenery, the city sure does not look this beautiful! Then you recommence your knot, synching it up tight to the split ring making sure to wet it before it closes firm. You check it and make sure you are good to go. Once the lure is hurled, you loosen up and hone in on the line. You watch that line like a hawk and feel the lure pulsating in your hands. The lure then hits the bottom and quickly grabs your full attention. Just the bottom you think but wait that might be a fish. You stop the lure a few seconds and resume your retrieve, hoping to unite with that first fish but nothing happens. A few more casts in that location and no action. A short walk up the river bank to another location where you view a seam that cannot be passed up. The lure runs down the river bouncing over the shallow shelf and then into the deep water beside it. Sha-bang that first fish can’t resist; a brown trout surfaces before diving back down to the river bed to shake the lure out from its toothy jaws. Not this time as the fish is scooped up in the soft rubber net and carefully admired. You have now found that sweet spot in the river as another fish has taken that bait. One after another you find victory. Finally after six fish have been landed the fish discontinue their feeding frenzy. It is wise to move along to another piece of real estate and investigate again. The hunter is on the prowl to find his prey. Knowing how to dissect a river is an important piece of the puzzle and an art form in itself. Once you know how to read water you will be rewarded with some colossal fish and your journey will be productive. It does not really matter if you catch one fish or one hundred, you are home and home is where the heart is. You never want to leave and make sure you are never away for long. The fish seem to call you back. In all seasons and in all temperatures, no one can keep you away. The journey for serenity at last ends when you come home! Interview with fishing funny man Dave Mercer at Calgary, Alberta’s Bass Pro Shop March 26 2011. Dave was kind enough to give his time to me and sit and chat about fishing and his television show. Watch as we share a few laughs and talk about sport fishing. There is something special about river fishing! It brings me back to simpler techniques and times. River fishing to me is less stressful because I don’t carry the bass fishing tournament mindset. Time spent in the river is a time for letting go of everything. The noise of the water, the smell of the air, and the nature around me, sets the perfect stage for catching a fish. River fishing is man vs. nature at its finest! The power of the fish paired up with the raw power of the river makes the fight all that more special. No matter the size of the fish caught there is something special about landing a fish in the river. The beauty about river fishing is that anyone can try it! But please, respect the shore line and the waters by not throwing your trash all over the place. Please dispose of your trash in the proper trash bin. Also, respect other anglers by giving them space! Don’t start fishing their holes because you see them catching fish. The old angler says to the young angler as they looked down watching the trout gather to feed above the riffle, “what do ya say we just mosey on down and catch all of them fish in that river”. The young angler is game and accepts the offer. They simultaneously cast out and reel in hoping to strike. The fish are fussy at first but eventually can’t resist the allure of that minnow. Pretty soon the young angler has a high flying rainbow trout. The fish is launching out toward the bright sun. The young angler fights as the old angler stands beside and observes the tussle. Soon the fish is under control as the young angler exerts every ounce of energy to land the fish. What did the young angler do to keep the launching rainbow trout on his barbless hook? Many times when we hook a rainbow trout the fish goes airborne and gets off leaving us with that empty feeling. It’s especially frustrating when it’s the first fish of the day or the biggest one we have laid eyes on. How then do you keep that rainbow trout from getting off and getting the best of you? Keeping constant pressure on that fish is part of the recipe for success. If your line goes slack for even a second that fish is gonzo. Examining your line closely will give you the advantage you need and keep your reaction time quick. When that fish goes airborne it is critical that you are able to reel fast and keep the fish on. Keeping the rod tip high in the air will keep a tight line and prevent escape. What you might also need to do is prevent that fish from flying out again after its initial breach. You will turn your rod tip to the side to keep the fish submerged in the water, further preventing the trout from making a second leap for freedom. Hooks are a big part to keeping your fish on the line. There are different styles of hooks on the market that you can make barbless which give you a way better chance of keeping those high flying rainbows hooked up and locked on. The Triple Grip hook by Mustad features a unique bend that forces fish to hook elbow, making it virtually impossible to throw the hook, and an in-line hook eye point for 100% power with each hookset. Even though you are barbless, the bend in this hook will significantly increase your chances of keeping that feisty rainbow from throwing that hook. It is important to match the hook size with what was on the lure from factory. Many tackle companies tank test lures to make sure they run true and give the perfect wobble right out of the box. If you use a hook that is smaller or larger than that of the factory hook, it may throw off the balance of the lure making the lure work incorrectly. In many cases there are just days where despite everything you use and try to keep your fish from escaping, they soar out and get off. That’s fishing friends and part of the sport! It is important to observe all rules while out fishing. Some rivers or lakes have a single barbless rule in place which means a single hook is to be used, no trebles and that single hook is to be barbless. Please read and obey all local fishing regulations. Obtain a copy of your local fishing regulations and study that guide. Make sure you comply with the rules. Hard water fishing can be a bore and snore at times! Looking down an 8 inch hole can make watching paint dry look like the Super Bowl of entertainment. If you are bringing someone who has never ice fished before in their life you better be getting fish! It can be cold and windy so if there is no hot action from the fish to keep them warm, they are going to be turned off! Don’t take them out for fish that take a long time to catch! The idea is to keep them catching and focused on the fish! Enter the almighty and powerful Perch! Perch fishing is the answer and lure to keep newbies having fun! Perch will bite just about anything and are all over the lake! From a foot to eighty feet of water, Perch can be caught! From minnows, to spoons, and even little tubes the options are endless for bait! I like to drop shot a minnow for them! I find I feel the bite a lot better on the drop shot as you feel the weight of the bite instead of the sinker! The best part of Perch fishing is that there are so many Perch wanting to inhale your lure! Keep a few for yourself as they make for a tasty fish! Deep fried or pan fried coat them with a batter and you’re in Heaven! Perch fishing will have the novice wanting to go out more and more! Once they become comfortable with hard water fishing, venture off and tackle some Lakers and Whities!! Hook them up with one of these brutes and they are hooked for life!! Back when I first started out fishing I carried around a tackle box which held all my fishing gear. The standard goodies were in this unwieldy chunk of plastic, you know the red and white bobbers, the old packages of snelled hooks that have never been opened, and don’t forget those old jigs that have seven years of dust and rust on them. When I opened this apparatus the foul stench of old maggot jars would burn every nose hair in my nostrils. The odd living fly would make its getaway and buzz by my face scaring me half to death. The hinges would groan barely opening and duct tape would fill the holes where there was once plastic. If I walked and fished the banks of a river, I would have to put the tackle box down every time I made a cast. Usually these tackle boxes were passed down from father to son, or from grandfather to grandson in my case. My grandfather’s tackle box became my tackle box after several years of cob webs while sitting idle in the garage. I hit the water and opened the rusty handle of the box scrambling to get the mess of metal untangled and into the water. The decaying metal hooks would always find a way into my bulky fingers and foul words would exit my lips. I finally get to my favorite fishing hole and I’ve wasted my first hour of sunlight attempting to make use of what was once an organized smorgasbord of shiny new fish snacks waiting to be catapulted in front of the biggest Brown Trout I have yet to lay eyes on. I would lug this baby around on every fishing voyage with pride and made great use of it for many years, but one day it just blew up and fell apart right there on the water’s edge. I was upset after the blow out and a Brown Trout in the river saw me shed a few tears. Faintly I heard that trout whisper to me, “Just go get another box and quit your whining”. So off I went to the tackle shop to acquire a new box. I arrived and browsed the shelves like a kid does when he enters the candy store. My eyes wandered from side to side scanning the shelving like a hawk, look at that box and wow that’s cool too. I went up and down those two isles for at least thirty minutes before picking my new back pack and not a box. Welcome to the new world of tackle organization. The fishing pro said he used a back pack and not one of those old boxes gramps handed me down. “But why a back pack” I asked the guy bewildered. He explained to me that I could hold numerous more pieces of tackle and keep it appropriately organized. Not only that, I could fish as I walked up the river not having to stop and drop the old box of plastic every time I made a cast. This would maximize my time on the water and increase my hook up rate he stated concisely. “It is perfect for all tackle sizes and shapes but you will need to buy some plastic tackle organizers to accompany the back pack”. Oh yes I need to spend more money now but pondering the thought of just putting the hooks directly into the back pack I opted to take his suggestion. I bought three plastic Plano tackle organizers which would suit the size of my fishing lures, paid for them and went home to get my tackle in order. So let’s break it down! 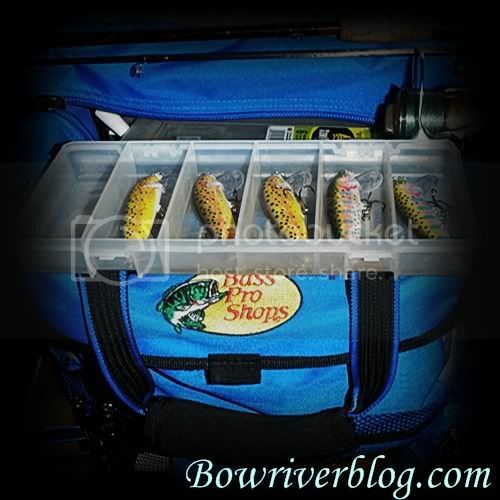 Today many tackle systems have removable dividers or removable utility trays for easy access and convenient storage to make locating your favorite lure quick and efficient. I will write on my trays as to what they hold. For example on each tray I write down what it contains to save time and get to my tackle fast and proficiently. A black permanent marker does this perfectly. I organize my lures as per the manufacturer of the lure. Rapala Countdowns go into one selected tray that holds six lures. Berkley’s into another tray. I organize by color patterns for less digging around and more fishing. Rapala Rainbow Trout patterns all go into one tray, Brown Trout Rapala’s go into another and so on. I go one step further and set out my tackle according to where I will be fishing the next day, what the weather is like or what season of the year it is. The more together you are the more hooks ups you will encounter. Lastly I make sure all my hooks are checked and the split rings are firmly planted onto the body of the lure. It’s always fun until someone loses a fish! Everything has a place and everything in its place! Getting organized is cheep and affordable which makes fishing that much more productive and comfortable. Thanks to the World Wide Web you can shop before you buy to get the best deal possible.